James Alvan Macauley, (he preferred to be called Alvan, to avoid name confusion with his father), was born on 19 June, 1872, in Wheeling, West Virginia, to James Alexander (Addison) Macauley and Rebecca Jane (Mills) Macauley (1849-1906). James Alexander Macauley was born in Maghrehar, Fermanagh county, Ireland, on 8 November, 1840. In his infancy his parents removed with him to Glasgow, Scotland, but finally joined the throng of liberty-loving home-seekers and emigrated to the "Home of the Free", and in 1850 landed on its soil. The family settled first in the Jefferson county, Ohio, but in 1854 removed to the city of Wheeling, Virginia. James Alexander received his education in the public schools of Jefferson county, Ohio, and Wheeling, Virginia, to which he has added valuable and useful acquisition by his own "midnight lamp", all supplemented by a thorough course of law studies, from 1865 to 1868—after he had come home from the war, and was admitted to the Bar in 1868. In 1861, when his adopted Government called for her citizen soldiery to rise up for the preservation of the Union, James Alexander threw himself into the breach as a volunteer in Company E, First Virginia Volunteer Infantry, of which he was made sergeant. Those were three months' soldiers. At its expiration he re-enlisted in Company A, of the same regiment reorganized, and served faithfully until, in the fore-front of the hot Port Republic, 9 June, 1862, he lost his left arm, and was taken prisoner. As a wounded prisoner, he suffered with his Union comrades at Richmond's Libby and Belle Isle, when he was paroled, sent home, and was soon after honorably discharged on account of his disability. James Alexander Macauley was subsequently clerk in the Wheeling post office, then filled a like position in the State Treasurer's office, and finally was elected State Treasurer for West Virginia (1868-1870). At the expiration of his term he was made Examiner in the United States Pension Bureau. In 1865 James Alexander married to Rebecca Jane Mills of Wheeling, also from Irish origin from Fermanagh county. Alvan Macauley grew up in a home, where the value of education and hard work was constantly emphasized. In 1880s the Macauleys moved to Washington D.C. where Alvan was educated in the public school system. He attended Lehigh University in Pennsylvania and gained an engineering degree, then he earned a law degree at Columbian College (now known as George Washington University) in Washington, D.C. Upon graduating in 1895, Alvan Macauley joined the Washington D.C. law firm of Church and Church as a patent attorney, working mainly for a client, the famous National Cash Register Company (NCR) of Dayton, Ohio. Later Macauley became head of inventions at NCR. In 1896 he applied for his first patent for cash register (assigned to NCR) (see the cash register of Macauley). In 1901 Alvan Macauley moved to St. Louis to become the general manager of American Arithmometer Company. He revitalized the company and by 1905, seeking to expand the operation, he set his eye on a certain alley, but the city was unwilling to give it to him, as his predecessor, who had left the company on angry terms, still had a good deal of political influence in the city and was blocking the move. Macauley responded by traveling to Detroit, Michigan, securing an alley and other real estate there, and returning to St. Louis. At night after business hours, he had the entire factory loaded onto boxcars and shipped to Detroit. In the morning St. Louis woke up, to discover that the company had left town. Alvan Macauley led American Arithmometer Co. (which would become Burroughs Adding Machine Company in 1905), for five years in Detroit. 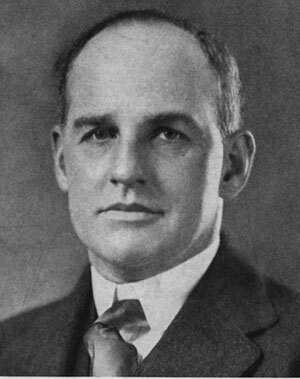 In 1910 he was hired as general manager of Packard Motor Car Co. of Detroit, and became the president of Packard in 1916. In the 19 years that Alvan Macauley has managed Packard, the company has grown to first place in the fine-car production field. He stepped down as president of Packard in 1939, but stayed on as chairman of the board until 1948. On 20 November, 1895, Alvan Macauley married Estelle Littlepage (1873-1976) of Washington, D.C. They had three children: Alvan Macauley Jr. (1896-1982), Edward (1902-1957) and Margaret (1904-1973). Alvan Macauley stood 178 cm tall (rather tall for his time, a century ago, American men ranked as the third tallest in the world, standing at 171 centimeters! ), sported a clean-shaven square jaw, and had a rather friendly visage, given his reputation for being something of a cold fish. He was a man of innumerable private passions and quirks. He disliked people who jingled the change in their pockets or had gold fillings in their teeth. Many are his hobbies. He played golf, was an excellent marksman (particularly when wild ducks are the target), had a large private collection of firearms. Many of his leisure hours were spent in his woodworking shop, where he made furniture, especially English period pieces. He went to Florida every winter, and to Europe once a year. A sign over his office door proclaimed: "Important If True." 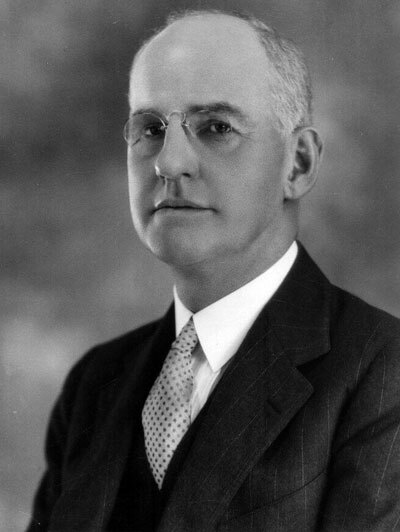 In 1928 Macauley became President of the Automobile Manufacturers Association. He served in that post until 1945. 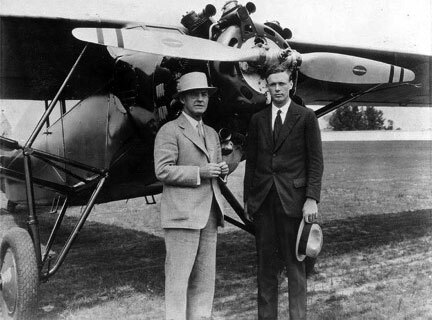 He was also responsible for many outstanding achievements such as the first diesel engine to lift a plane from the ground, piloted by the famous Charles A. Lindbergh (see the lower photo). James Alvan Macauley died on 16 January, 1952, in Clearwater, Florida, from an attack of uremic poisoning and pneumonia.